HadGHCND is a gridded daily temperature dataset based upon near-surface maximum (TX) and minimum (TN) temperature observations. It is designed primarily for the analysis of climate extremes and also for climate model evaluation. It spans the years 1950 to present and is available on a 2.5° latitude by 3.75° longitude grid. This dataset has been developed in collaboration with the United States National Centers for Environmental Information (NCEI), formerly the National Climatic Data Center (NCDC). HadGHCND has been created using daily station observations in NCEI's GHCN (Global Historical Climatology Network)-Daily database. This consists of over 27,000 stations with temperature observations, though many of these have quite short records, or gaps in the record. Quality control has been carried out to indicate potentially spurious values. We have filtered down these stations to obtain those for which we can adequately calculate a 1961-90 daily climatology. 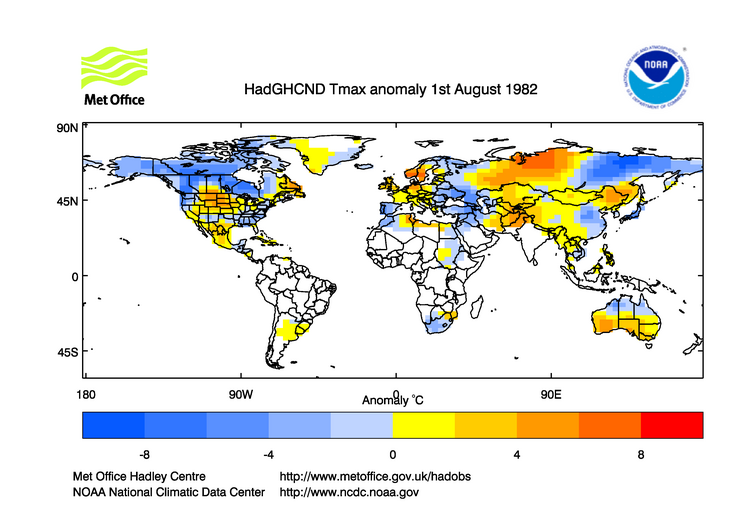 The dataset represents anomalies from the 1961-1990 climatology. We have used an angular-distance weighting approach to interpolate the station data onto the required grid. We chose to grid the station anomalies to overcome some of the issues associated with elevation dependence. The data are available as gridded anomalies, relative to the 1961-90 base period, and also as gridded actual temperatures. The actual temperatures were created by gridding the daily normals and adding these to the relevant daily anomaly. HadGHCND is regularly updated by NCEI and the Hadley Centre and provides a near-real time update of daily maximum and minimum temperature fields across the globe. A variety of daily monitoring plots are available. Temperature extremes indices, based upon the ETCCDI extremes indices, have been produced using HadGHCND and are available from the download page. These are in association with the CLIMDEX project.